Port tongs were invented some time around the 18th century and were typically used in Europe to highlight a great bottle of Port. If you are looking for an exciting way to open a fine old Vintage Port, try using port tongs. Port tongs work by creating a drastic temperature change in the glass neck of the port bottle that breaks off the upper neck and cork clean and in tact. When done correctly, there are no shards of glass and the break has a clean sharp edge. I love using my Port Tongs on special occasions with family and friends. You can pick them up on your next trip to Portugal or order a pair online. The cost is approximately $100. 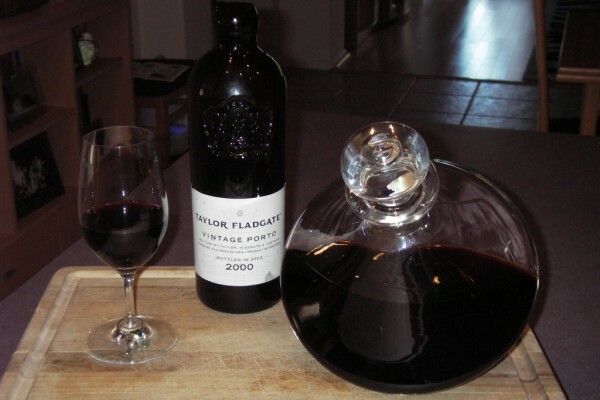 Below is an example of me opening a bottle of Taylor Fladgate Port Vintage 2000 with my port tongs. Warning/Disclaimer/Safety Note – Port tongs, if used incorrectly, can cause injury and ruin a good bottle of port! Do not use port tongs until you have read all of the manufacturer instructions. 1. Heat the tongs – make them HOT. 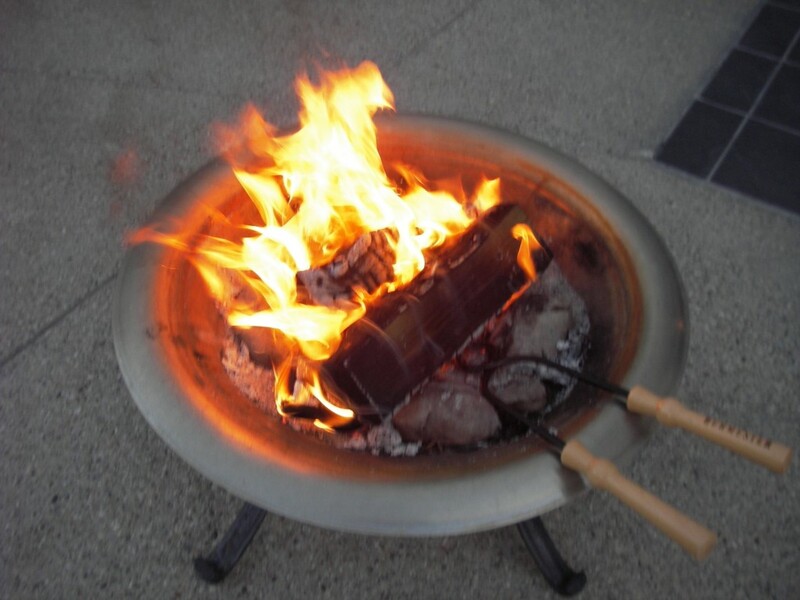 Traditionally a wood fire is used to heat the ring end of the tongs. Hold the ring end in the fire until it is red hot. 2. Set up your port bottle close to the fire. 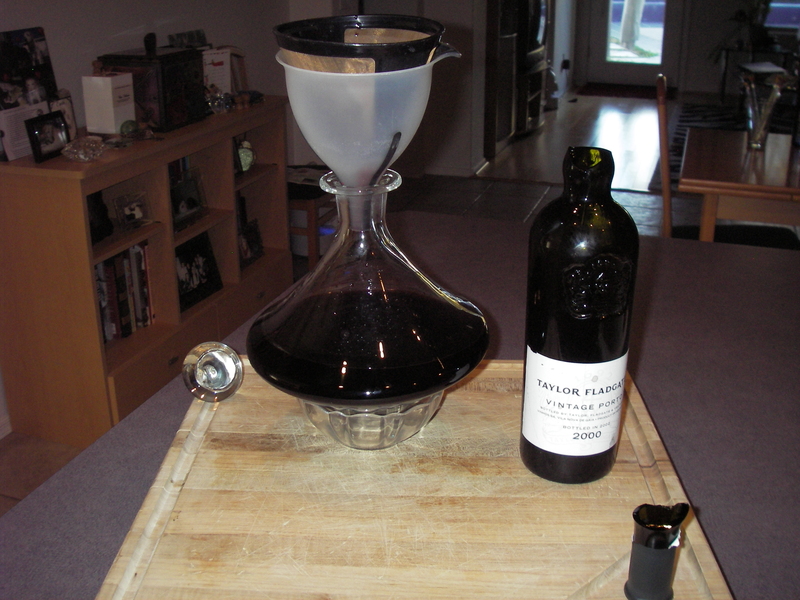 Stand it up and remove the capsule so the entire neck of the port bottle is exposed. 3. Using a bowl with ice and water, submerge a hand towel and keep it close by. 4. Remove the tongs from the fire and clamp down on the neck of the port bottle. Make sure you are clamping below the cork and above the level of the wine. 5. Hold the neck of the port bottle with the port tongs for 1 to 2 minutes. This heats the glass at the point were the tongs clamp around the neck. 6. Remove the tongs and set them down in a safe, non-flammable location. (Do not do what I did one time and place the hot tongs on the wood Port Tong box lid and burn it.) Immediately take the cold wet towel and wrap it around the neck of the port bottle. You will hear a snap. This is the glass contracting and breaking clean from the sudden change in temperature. 7. Remove the towel and carefully lift off the top of the bottle. 8. 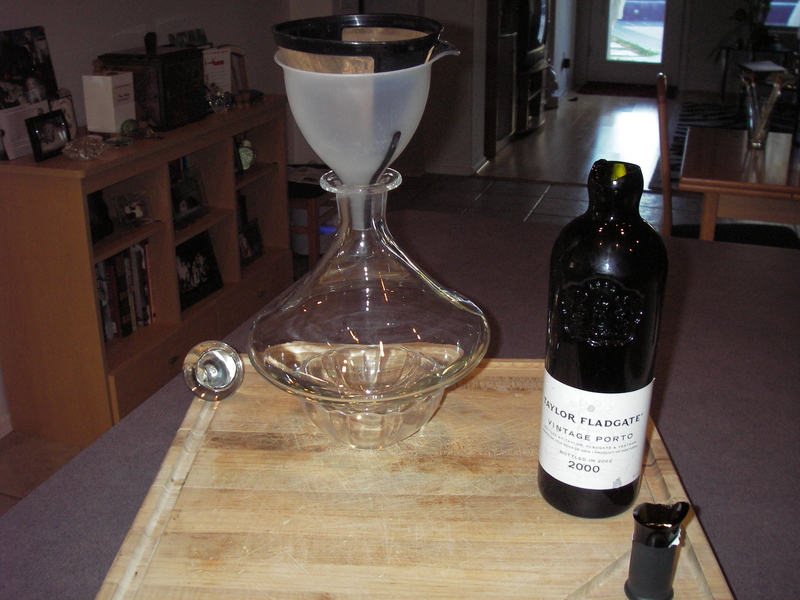 Now you can decant the port as usual, using a funnel and wine strainer. Here is a video with an abbreviated version of the instructions.